This emotionally charged event is designed to dramatically show teenagers the potentially dangerous consequences of drinking alcohol and driving. 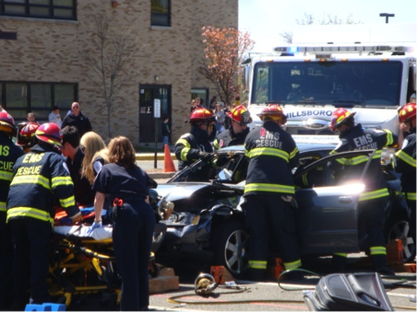 "Every 15 Minutes," showed seniors at Hillsborough High School the affects of a drunk driving crash, with their classmates taking the roles of driver, victims, and passenger. Other students took the roles of deceased teenagers to represent the teenagers who die in drunk driving accidents — the incident occurs every 15 minutes, the program states. In addition to a rescue effort, the day continued with a hospital trip, pronunciation of death, charges for the student portraying the driver and a trial in Hillsborough Municipal court. While the entire class did not attend the hospital trip or trial, the scenes were videotaped and shown to them the following day. They concluded with a mock-memorial ceremony at the school. Our thanks to University Hospital in Newark and the NorthSTAR medevac helicopter for bringing this program to Hillsborough.